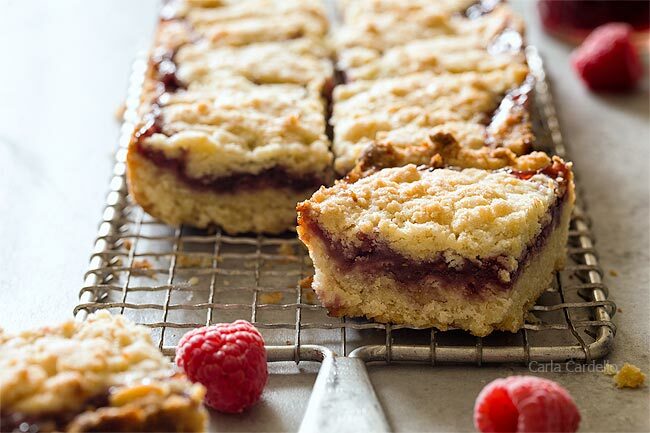 Everyone’s favorite jam bars baked in a loaf pan! 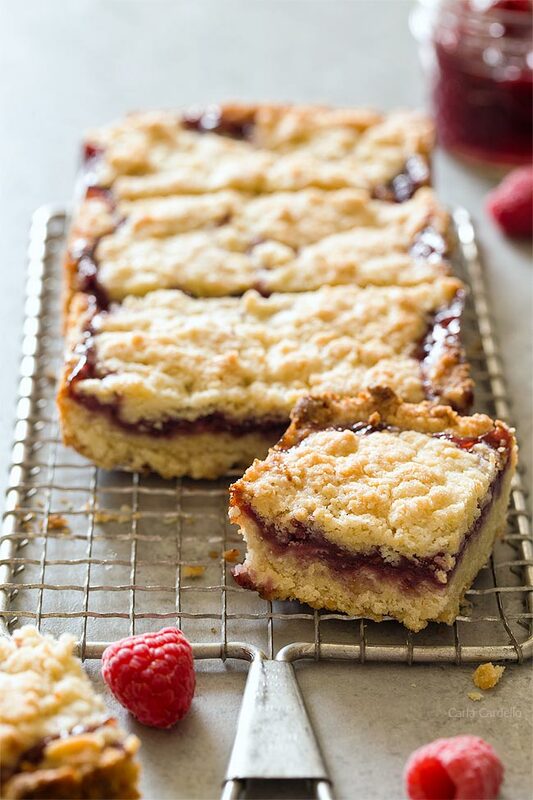 These Small Batch Raspberry Crumb Bars are made with a buttery dough and raspberry jam in the center. Makes roughly 8 squares. Hello September! I’ve been in a bit of a funk lately, so I’m trying to figure out how to push through that. Most of it is a long story and not one I’m ready to share publicly yet, but you may (or may not) have noticed I’ve pulled back on posting. Maybe it was a summer slump. Maybe adulting is catching up to me. Maybe I needed more of a break than I realized. I’m still really super active on Instagram, so as always find me on @homemadeinthekitchen, @citylifeadventures, @becauseiloveicecream, and @becauseineedcoffee. To get myself back into it, I decided to go back to the beginning – baking. I baked all the time even before it became my job. It’s always hard to bake in the summer due to the heat, so when there was a break in the weather due to the rain (look at how crazy! ), I took advantage. It’s still hard to tell whether it’s summer or fall based on the weather, but regardless I’m back doing some small batch baking with my trusty loaf pan. If you don’t have one already, I highly recommend you buy a 9×5 loaf pan, even two if you bake a lot like I do. 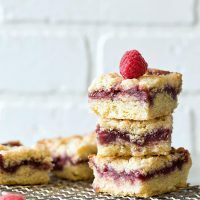 I’ve been making (and eating) jam bars for as long as I can remember. 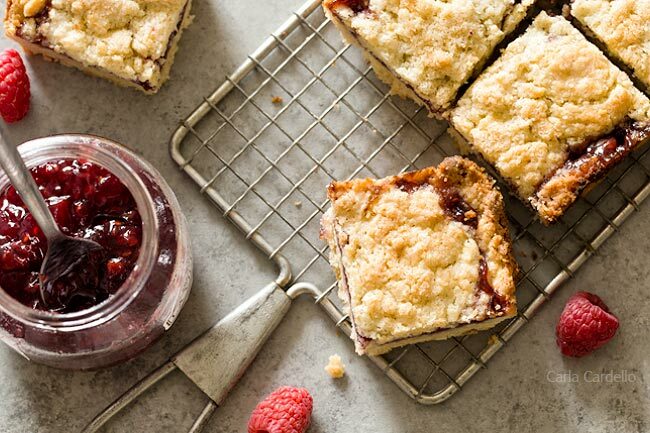 These Small Batch Raspberry Crumb Bars is one of those recipes every baker starts out with in the beginning. 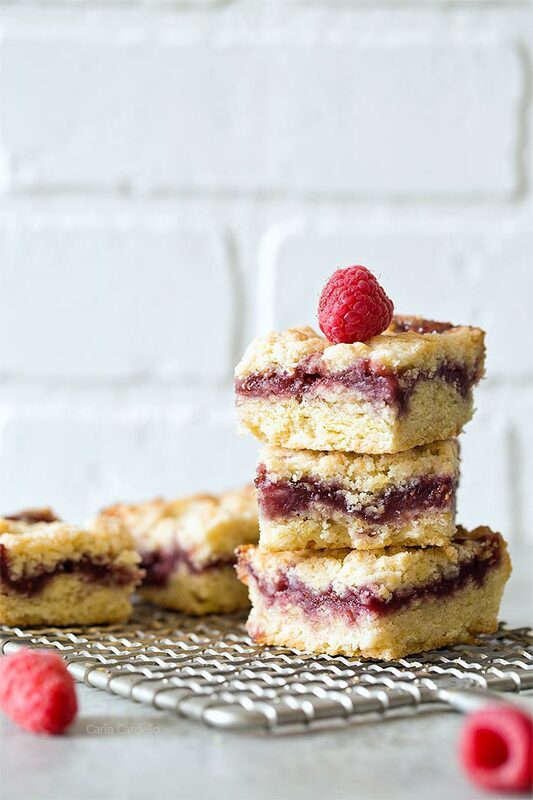 They’re bars with a buttery crust and a raspberry jam filling. The crumb part is the same dough as the crust, so you only need to make one component for the whole thing. You don’t even need to use your mixer! For my first test batch, I adapted my Apple Pie Crumb Bar recipe and cut the recipe in half using 1 egg yolk. I didn’t have enough dough for both the bottom and the top, so I went back to using 1 whole egg. Fine by me because then I don’t have to worry about leftover egg whites. The second batch I baked it at 375F. I’m not entirely sure why other than that’s what the original recipe called for, so I tested it a third time at 350F. Although both were wonderful, I liked it slightly better at 375F because the edges were a little browner. The dough will be a bit crumbly and dry; however, it should form a dough when pressed together with your fingers. If it’s still too crumbly to handle, add a drop or two of water to bind it together (but not too much because it shouldn’t be wet and sticky). For the filling, I used La Vieja Fabrica – a fruit spread made with fresh fruit pieces. Their cooking process allows them to retain the natural texture, color, and flavor of the fruit, which means the spread tastes homemade without you having to make it. This is especially ideal when it’s not fresh fruit season. 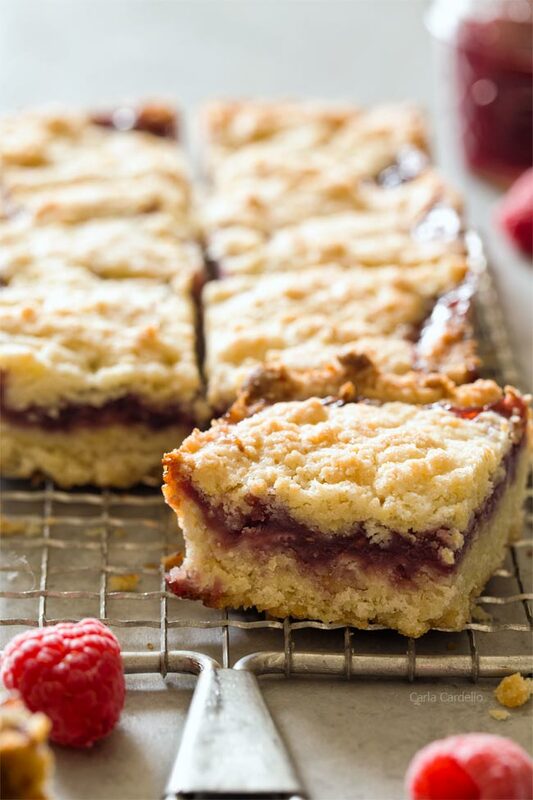 That means I can make these raspberry crumb bars any day of the year. Plus they have a variety of flavors, so you can choose your favorite fruit. 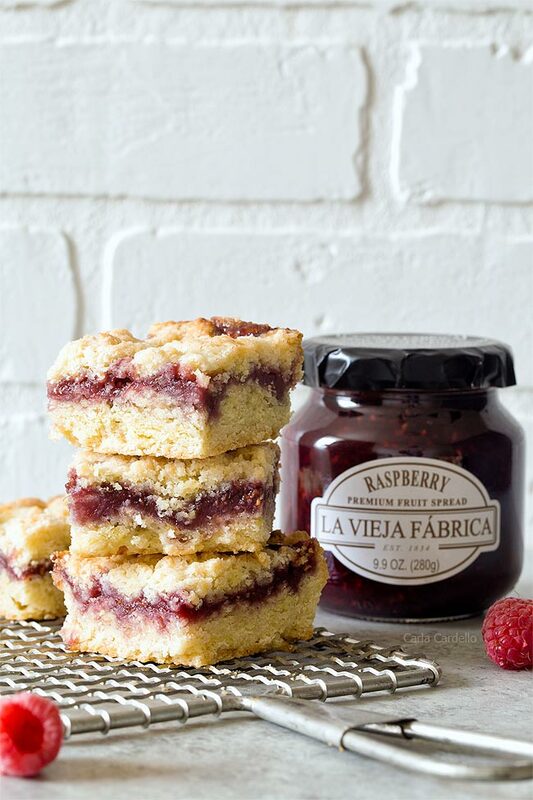 You can find La Vieja Fabrica in your store’s jam and jelly aisle. This recipe makes up to 8 squares, depending on how you cut it. They also last up to 1 week in an airtight container (assuming you don’t eat them all by then). Preheat the oven to 375F. Lightly grease a 9x5 loaf pan and line with parchment paper. In a large bowl, whisk together the sugar, flour, baking powder, and salt. With a pastry cutter or two knives, cut in the butter until the pieces look like small pebbles. Cut in the egg with the pastry cutter. Dough will be dry and crumbly but should form a dough when pressed together. If it's too dry, add a drop or two of water. Dough should not be wet and sticky. Reserve 1/2 cup for the topping. Pat the rest into the bottom of the pan. Top with raspberry preserves. From the 1/2 cup reserved dough, press some of the dough together to form pieces then cover the preserves as much as you can. Bake 40-45 minutes or until the top is golden brown and the edges pull away from the pan sides. Cool completely before serving. Store leftovers in an airtight container for up to one week. Disclosure: This post is sponsored by Mario Camacho Foods and also contains Amazon affiliate links. Thank you for supporting me and the companies I work with as sponsored posts help pay for website hosting and groceries. Just what a family of two needs :-) Thank you very much ! Enjoy! Let me know if you make them. Made the bars on Saturday and the whole batch was gone on Sunday ! Is there any better recommendation than this one ? :-) Thank you Carla ! Definitely! You can make almost any flavor you want.